While, it might not be the smartest idea to hunt in the middle of a thunderstorm, this has always been one of my favorite times to hit the woods. There is just something about the peacefulness the rain brings to the woods. Being out there alone, watching the wildlife can be pretty incredible. I am the type of person that likes to walk that fine line between determination and stupidity, I’ll admit. A couple Saturdays ago, I hit the woods at the beginning of a thunderstorm, early afternoon. I will say that I was smart enough not to sit in my ladder stand, but instead found a nice little patch of brush, and a tree stump to sit on. 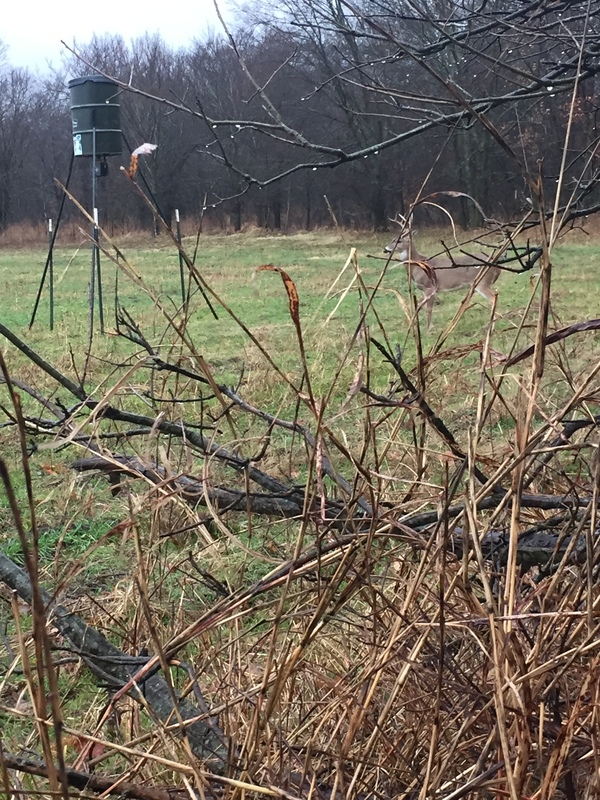 I sat about 25 yards from the feeder over a wheat field, and ended up drenched from head to toe. Not only did I see around 30 turkeys walking along the field for quite some time, I had a little 7 point hang out with me for a while also. Had my daughter been with me, he would have been great for her first bow kill, but she stayed with her daddy since the weather was icky. He was a little small for me to shoot, but it was great watching him for so long. I also had the privelege to test out some new potential products for upcoming sportsman’s boxes and I have to say that I was VERY impressed! My favorite part of bowhunting is drawing the animals in so close. There is something really cool about sitting within 20 yards of a whitetail deer, especially when you are able to watch them from that distance for an extended period of time. How many of you like to hunt in the rain?